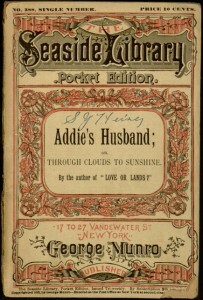 This week’s eBook release is Addie’s Husband; or, Through Clouds to Sunshine, by British novelist Mrs. Gordon Smythies. Like many British novels, this one was reprinted in America as part of George Munro’s Seaside Library, quite possibly with little or no compensation to the author. From there, it eventually made its way to our Digital Library, and from there, to Distributed Proofreaders and Project Gutenberg. As the title suggests, the book is a romance, telling the tale of a young girl thrown on the world when her father squanders the family fortune. Help comes in the form of an unexpected marriage, but, needless to say, there are plenty of melodramatic complications before the promised sunshine arrives. 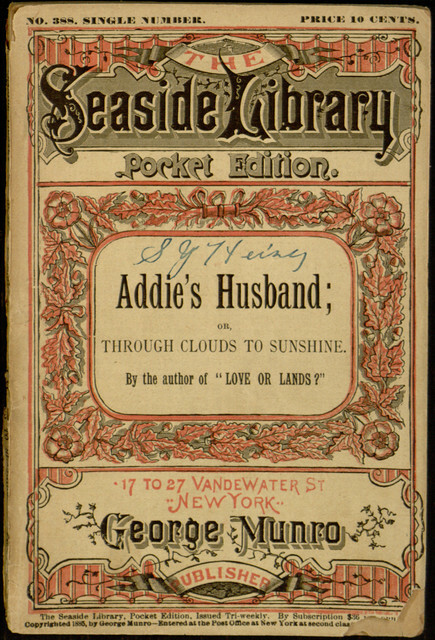 While the book stays well within the bounds of most 19th century romantic conventions, it is perhaps noteworthy for giving both its hero and heroine physical and emotional imperfections and at least a hint of pragmatism, in an era where many similar novels featured exaggeratedly idealized characters driven by extreme passions.